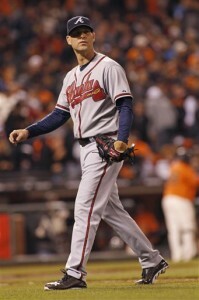 Tonight the Giants start a three-game series against the Atlanta Braves. To mark the occasion, I’ve utilized Baseball-Reference’s multi-franchise tool and compiled a team out of the guys who played for both the Braves and the Giants. In the case of the two teams, they’ve shared 248 players. I whittled it down to a 25-man roster. I judged players on the strength of their peaks or whole careers, not necessarily how well they did in either Boston/Milwaukee/Atlanta or New York/San Francisco. This lineup is pretty solid. Rogers Hornsby alienated everyone he ever had anything to do with, so he only played for the Giants in 1927, after which they traded him to the Braves, where he lasted one season before being traded to the Cubs. Despite his poor defense, you have to take him over Eddie Stanky, who still makes our bench. Backing up the lineup is a strong bench. One could argue that Butler should start instead of Alou, but I like Alou’s arm, rather than Butler’s, in right. Also, Orlando Cepeda better not get hurt. Two Hall-of-Famers top a good rotation. And look at Tim Hudson, whom I wasn’t expecting to include! He’s actually had a better career than Johnny Antonelli, Jesse Barnes, and other Giants-Braves players I thought I’d see in this rotation. There’s another Hall-of-Famer, which makes for three on the pitching staff. This is an excellent bullpen with strong arms able to come in and help out if any of the guys in our rotation were to stumble. This entry was posted in Uncategorized and tagged Al Dark, Atlanta Braves, Bob Elliott, Boston Braves, Brett Butler, Burleigh Grimes, Darrell Evans, Dave Bancroft, Dave Koslo, Doc Crandall, Dolf Luque, Eddie Stanky, Ernie Lombardi, Felipe Alou, Gaylord Perry, Hoyt Wilhelm, Kenny Lofton, Milwaukee Braves, Orlando Cepeda, Red Schoendienst, Rogers Hornsby, Sid Gordon, Steve Bedrosian, Stu Miller, Terry Mulholland, Tim Hudson, Walker Cooper, Warren Spahn. Bookmark the permalink.